Much of the written and drawn materials of the Frank Matcham architectural practice were lost in WWII. The Frank Matcham Society donated its small collection to the Theatres Trust, which is the national body for the protection of theatres old and new. This and other useful sources of archival material are listed below and some may remain in the hands of the theatre owners and private collectors. 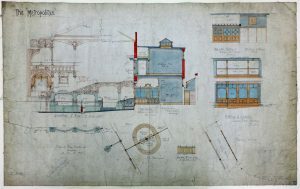 It is hoped that recent projects to improve the cataloguing of the architectural drawings at the London Metropolitan Archive and the Theatres Trust, in addition to the holdings at the V&A, will improve access to this cherished heritage. View the short video ‘Bombastic Rubbish – The Theatres of Frank Matcham’ by Angel Sharp Media about how his theatres became the places to see circus, comedy, song and dance, opera and drama. London Theatres: Michael Coveney with photos by Peter Dazeley, Frances Lincoln 2017 ISBN-13: 978-0711238619 Just published with foreword by Marl Rylance. The Spectator review is here. The ABTT Sightline review by Rupert Rhymes is here. The Theatres and Concert Halls of Fellner & Helmer: Michael Sell, Cambridge Media Group ISBN: 9781904031772 detailed study of the Austrian architect’s work across Europe. Theaters: Craig Morrison, Norton/Library of Congress Visual Source Books series 2005 ISBN 978-0-393-73108-8 comprehensive richly illustrated history of theatres in the USA. Charles John Phipps F.S.A. : Görel Garlick, Entertainment Technology Press 2016 ISBN 9781904031895 Biography of the prolific Victorian theatre architect, predecessor and influence on Frank Matcham. Variety at Night is Good for You: J O Blake, Badger Press 2016 ISBN 978-0-9526076-6-3 Just published with a foreword by our own John Earl. Read the review by theatre architect Tim Foster here. The impressive Arthur Lloyd Music Hall & Theatre History website maintains a list of recommended books about Frank Matcham and theatre history. The Theatres Trust has a list of theatre books with which they are associated with. A search of your preferred online source will find additional titles which include references to Matcham theatres in various context. Several Matcham designed theatres are pleased to promote his work for their theatre and produce a written history in book form, which may be purchased direct.